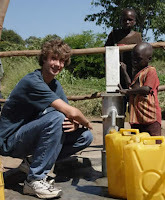 At the age of 17, Ryan Hreljac is a compelling voice for those impacted by the water crisis throughout the developing world and his story has inspired many of all ages to take responsibility for their world, whether in their own communities or, like Ryan, in far away places. He is the founder of the Ryan’s Well Foundation, an organization supporting activities to BUILD safe water sources, EDUCATE individuals, schools, corporations and other service organizations to create awareness of water related issues and those with limited access to resources and MOTIVATE present and future leaders to realize their own global citizenship. In 1998, 6-year-old Ryan Hreljac was shocked to learn that children in Africa had to walk many kilometers every day just to fetch water, the most basic element for human survival. Ryan decided he needed to build a well for a village in Africa. By doing household chores and public speaking on clean water issues, Ryan’s first well was built in 1999 at the Angolo Primary School in a northern Ugandan village. The well continues to serve thousands of people. Ryan’s determination grew from the $70 collected by doing simple household chores to the Ryan’s Well Foundation that today has contributed a total of 432 wells in 15 developing countries bringing clean water services to 577,640 people. Ryan, what you've done with Ryan's Well is amazing, but the thing that strikes me is that you didn't wait until society might have thought you "old enough" to make a difference. What gave you the confidence to start so young towards your goal and what advice would you give others in pursuing their dreams at any age? My story is really very simple. One day in January 1998, I was sitting in my Grade 1 classroom. My teacher, Mrs. Prest, explained that people were sick and some were even dying because they didn’t have clean water. She told us that some people walked for hours in Africa and sometimes it was just to get dirty water. All I had to do was take 9 or 10 steps from my classroom to get to the drinking fountain and I had clean water. Before that day in school, I figured everyone lived like I did and so when I found this out, I decided I had to do something about it. I started doing extra chores, telling family and friends about the water crisis to raise money for a well in Africa. My goal of clean water for all has grown from $70 collected by doing household chores to the Ryan’s Well Foundation. Over 10 years, Ryan’s Well has carried out hundreds of projects in more than a dozen developing countries benefiting over half a million people who now have access to clean water and sanitation services. My advice to anyone is that in order to make a positive change in the world, you need to find something that you are passionate about and then you need to take steps to act. Although they may be very small steps, if you keep at it and never give up, your impact will grow year after year. And whether you are a gas station attendant, the Prime Minister of the country or a kid in Grade 1, I hope my story is a reminder that we can all make a difference. This works regardless of whether you are short or tall, old or young. It applies to each and every one of us. As a consequence of the work of Ryan's Well over half a million people in the world now have access to clean water where they didn't before - that's amazingly impressive. We all know though that on the road to success, most people have setbacks. What was one setback on your journey and how did you deal with it and overcome it? I can’t really think of one set back specifically. We all have bumps in the road and we all need to learn to deal with them while keeping a positive attitude. I think your attitude is the most important part of dealing with any set back. Ryan, you're a hero and a role model to a lot of people out there in the world (young and old), we'd like to know who your heroes are - who do you look up to and respect in the world? I don’t really have any idols. I think that all people are human. We all have good characteristics as well as things we need to work on. If I really had to pick someone to admire it would be all the young people out there with the tenacity and determination to work for a better world. And finally - what's next for Ryan and for Ryan's Well? I have had an exciting and busy year. In late June, I returned from studying abroad with a school called Class Afloat (www.classafloat.com). I spent from September 2007 to January 2008 at a land based school in Lunenburg, Nova Scotia. From February to June 2008, I studied and helped crew on the tall ship “Concordia.” Over the five months, we traveled to Salvador (Brazil), Buenos Aires (Argentina), Tristan da Cunha (United Kingdom), Cape Town (South Africa), Walvis Bay (Namibia), St. Helena (United Kingdom), Ascension Island, (United Kingdom), Fernando de Noronha (Brazil), Natal (Brazil), Belem (Brazil), Barbados, St. Vincent, St. Lucia, Bahia de Samana (Dominican Republic), Hamilton (Bermuda) and Lunenburg (Nova Scotia). It was hard work and I was a little sleep deprived but loved sailing while learning about other countries and other cultures that make up our global village. This fall, I will begin my final year of high school in Kemptville Ontario. I’m a pretty regular teenager. The only thing different about me is that I have been working on this project since January 1998, more than half of my life. But there are many other young people doing the exact same thing. I continue to be involved with the foundation and have already had meetings with our new Executive Director and other staff and volunteers since my return to Kemptville. I continue to speak around the world on water issues and on the importance of making a difference no matter who you are or how old you are. Within the next few months, I will be in Taiwan, New York City, Toronto, Ottawa and western Canada speaking on behalf of the Foundation. I am very excited about our new youth program – Ryan’s Well Ambassadors. Youth, like me, will be participating in a 3-day workshop learning and talking about water issues and the work of the Foundation. I hope that these Ambassadors will help us to spread the word about the difference we can all make by working together to build, educate and motivate people in communities across the planet. The Foundation hopes to continue growing to take strong steps forward toward a brighter future for our friends in water poor countries by working with them to develop safe water points and proper sanitation so that they can build brighter futures for themselves. Only 100 days to go!